Widespread screening isn't recommended, but symptoms are cause to get evaluated. We routinely undergo mammograms and colonoscopies with the objective of catching breast and colorectal cancer early, when they're most treatable. So why don't we also get periodically screened for dementia using questionnaires, blood tests, or imaging scans? The U.S. Preventive Services Task Force—a panel of disease prevention experts—advises that there is no proven value in screening women without cognitive problems. The main reason for the difference in screening recommendations is that while there are effective treatments for cancer, such as chemotherapy, radiation, and surgery, there are no effective approaches for stopping the forward progress of dementia. "There are certain diseases in which we know that early detection can lead to early intervention, which can stave off worse outcomes, but if you don't have any kind of disease-modifying therapy at hand, it doesn't make a whole lot of sense to screen people who don't have symptoms," explains Dr. Aaron Philip Nelson, assistant professor of psychology at Harvard Medical School and author of The Harvard Medical School Guide to Achieving Optimal Memory. Certain tests for dementia don't offer much diagnostic value in general, including genetic tests for Alzheimer's. The only gene tests that can accurately determine whether you'll get Alzheimer's disease are for the autosomal dominant form, also known as familial early-onset Alzheimer's disease. It is very rare, accounting for less than 5% of total cases, and it typically starts before middle age. A blood test for the Alzheimer's risk gene, APO-e4, also exists. However, the use of APO-e4 as a screening measure is controversial because it can't determine for sure whether you will develop the disease. Also of questionable merit are the do-it-yourself, at-home tests for dementia that are marketed directly to consumers. The Alzheimer's Association doesn't recommend these tests, because they don't provide an adequate assessment of your risks. Distinguishing between normal, age-related memory changes and early signs of a more worrisome condition can be difficult. If you're going to be evaluated for dementia, you want a neuropsychologist, neurologist, geriatrician, or geriatric psychiatrist to do the testing and help you understand the results. Even if tests by professionals reveal that you have early-stage memory loss, called mild cognitive impairment (MCI), that does not mean you will definitely develop dementia. Although MCI increases your dementia risk, an estimated 40% to 70% of people with early memory loss will not progress to dementia within a decade. By getting screened, you may put yourself through needless stress and anxiety for an outcome that's both uncertain and unalterable. While screening for dementia when you don't have any symptoms doesn't make sense, Dr. Nelson states, "Any memory or cognitive changes that concern you—or the people close to you—warrant a visit to a geriatrician, neurologist, or neuropsychologist." Normal, age-related memory lapses—like forgetting the name of your high school English teacher, or having trouble recollecting where you had dinner on a trip to Paris—shouldn't be cause for concern. But call your doctor if you start to forget information you once knew well, or memory loss is interfering with your daily function. "When you're beginning to forget the name of your high school or your grandchild, or whether a close family member is dead or alive, or you have difficulty with tasks that were once familiar, like becoming disoriented in your own home or neighborhood, those types of episodes are concerning," Dr. Nelson says. When you see a doctor, you'll go through a series of tests, including a neurological exam to determine how well your brain and nervous system are functioning. The doctor will check your reflexes, eye movements, speech, and coordination. He or she will also ask you a variety of questions that will assess your visuospatial abilities (your ability to see how objects relate to each other in space; for example, how several different shapes fit together). You'll also be asked questions to gauge your short-term recall, attention, and language skills. Depending on how you perform on these tests, you might then be referred to a neuropsychologist for a more comprehensive evaluation. Your doctor may also order brain imaging tests, such as an MRI or CT scan, to look for structural problems in the brain. vitamin deficiencies, including B1 and B12. If tests determine you have one of these conditions, you can get treated. Your doctor will also consider whether you are taking any medications that affect brain function, such as antihistamines or pain relievers. 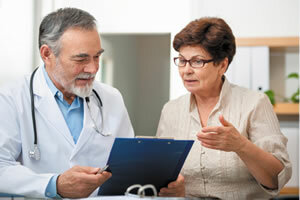 If you are found to have early-stage memory loss, your doctor can guide you through the next steps. Although there is no cure for dementia, cholinesterase inhibitor medicines might help with symptoms like memory loss and confusion. Your doctor can explain your options and help you understand what to expect. One of the advantages of early diagnosis is the opportunity it provides to start planning for the future while you are still able to clearly articulate your goals and wishes.